How I Got an iPod shuffle — and Liked It! Warning: The first part of this article mentions many iPod models, often distinguished both by a minuscule cognomen, such as “nano” or “shuffle,” and a generation number, such as “second-generation.” If you’re not an iPod expert, it might help to have at your elbow an encyclopedic historical list of models, such as this one from Apple. I run (if you can call it running) every day. I had this problem completely solved: I’ve been using a second-generation iPod nano for years, and loved it. But it finally gave up the ghost. 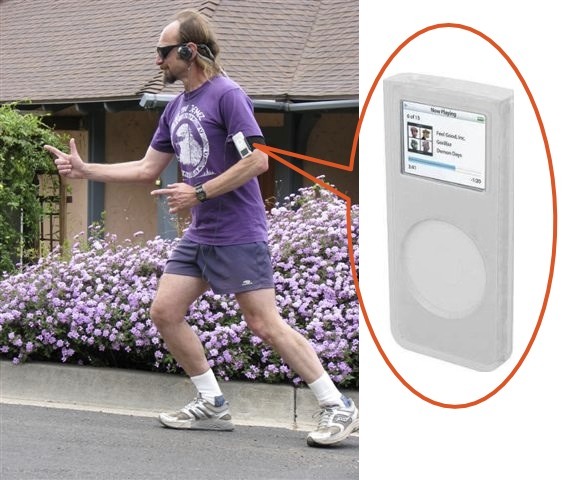 Apple no longer makes any iPods that I’m willing to take running with me — except, just maybe, the iPod shuffle. The solution: Hey, this iPod shuffle isn’t so bad! Now that I’ve spoiled the story by revealing the plot and the ending, let’s go back to the beginning. A Man, A Plan, A Nano — Picture me, preparing for my daily run. I’m exquisitely outfitted with my second-generation iPod nano. It’s encased in a thick protective silicone-rubber sleeve, attached to a velcro armband. I’ve run this way every day for years, rain or shine. Unfortunately, something (I suspect the aforementioned rain) finally damaged its internal electronics, and I had to seek a substitute. Even more unfortunately, as I discovered when I began to research the current iPod situation, Apple barely makes any iPod that I would consider acceptable as a successor to the second-generation iPod nano. To explain why, let me tell you what I loved about my iPod nano. It was wondrously simple, yet defiantly rugged, a slender aluminum rectangle with a tiny screen, a click wheel, and very little else. The screen was a crude, low-resolution LCD, capable of portraying no more than a few short lines of text. Yet this screen told me everything I needed to know: what’s playing, how long it is, how much time remains. And the screen was also an ingenious and powerful management interface, thanks to the click wheel, which not only provided the basic play/pause, next/previous, fast-forward/rewind, and volume-adjustment functionality, but also, in conjunction with the screen, enabled me to dive down into various menus to navigate settings, playlists, and albums, as well as scrolling to a specific point in a track. Crude as the screen was, I could see it even in the bright California sun. Even more important, the tactile quality of the click wheel meant that I could perform most functionality needed out on the trail (such as skipping a track, or adjusting the volume) without even looking at the device. The iPod nano also had no moving parts. That might seem obvious, but you should have seen me in the days before flash memory, trying to run with a portable CD player! Also, the moving parts issue is one reason I would never run with, say, an iPod classic, which contains a spinning hard disk. I do know people who run carrying an iPod classic, but I think they’re nuts. Hard disks can crash. Equally significant, I can crash, and I often do: I do a lot of smashing through brush, and stumbling and falling over logs and rocks, so I could easily jar that hard disk into eternal silence. Besides, an iPod classic is expensive. I’m not heading out into the dust and the rain with $250 worth of fragile equipment strapped to my arm! For the same reason, I wouldn’t usually consider running with my iPhone. To be sure, an iPhone is a wonderful device: besides being a phone, it contains a GPS, so it might stand in for my Garmin Forerunner 305, plus it’s a camera, something I frequently wish I had with me while running through the gorgeous Southern California scenery. I do walk with my iPhone, even into the back country; I carry it while dirt biking; but when I’m out there nearly naked, without pockets, facing the elements and pounding along, the expensive, delicate iPhone seems terribly out of place. And it’s too big! Another reason I don’t want to carry an iPhone is the screen. It’s hard to read in bright light (and the Southern California sun is very bright, one of the reasons I love living here); and it’s a touchscreen. This means that in order to manipulate it, I’d need to stop running, take the iPhone off my arm or out of its pouch or whatever, clean and dry my finger, unlock the screen, deal with the Music app, lock the screen, put the iPhone back in its place, and start running again. The iPod nano, with its tactile click wheel, could usually (as I’ve already said) be manipulated without my breaking stride; and if I did have to stop and change playlists, the screen backlighting was very bright, and the click wheel was protected from my sweaty hands by the rubber sleeve. The iPod classic, as I’ve already said, is expensive and has a hard drive; plus, it’s rather large. This is a pity, because its click-wheel-and-screen interface is extremely similar to that of my iPod nano. The iPod touch is effectively an iPhone without the phone, and, for the same reasons as the iPhone, wouldn’t make a good running companion: it’s too big, it’s too easily damaged, and it has a touchscreen, with all the attendant complexity. That’s a pity, because I happen to own one already, a third-generation model that I don’t use much any more. I seriously considered using it for running when the iPod nano stopped working, but decided against it. The current iPod nano had me momentarily tempted. After morphing its way through several generations, including the very strange small square of the sixth generation, it is once again, in its seventh generation, similar in size and shape to the second generation. But, darn it, it has a touchscreen! Plus, it’s relatively expensive at $149, not least because it’s loaded with electronics that I don’t need (Bluetooth, radio, accelerometer, and so forth). It’s a very clever device, but for running I want something simpler, sparer, tougher, and cheaper. Having gotten this far, I was nearly in despair. What was Apple thinking, in doing away with everything that, to me, made my iPod nano worth having? Was there nothing acceptable in their iPod arsenal? Such was the process of elimination that brought me, at last, to consider the iPod shuffle. I didn’t want to consider the shuffle. I had been brought this far very much against my will. I remember when the shuffle first appeared, and I thought at the time that it was just plain stupid. (Of course, that doesn’t prove much, since, as is well known, other things that I thought were stupid when they first appeared included Web browsers, iMacs, Mac OS X, and the iPhone.) But the shuffle had no display at all, and its name promoted its capability to randomize play order, which was just the opposite of how I listen: I like to set up playlists of podcasts and listen in order. Without a way to listen in order, without a way to choose and navigate a playlist — which surely must require a screen — the shuffle seemed completely out of the running (pun intended). It turns out, however, that the iPod shuffle, too, has undergone various mutations during its generational evolution. It has had more form factors than Oprah, ranging from a tall rectangle like a package of Juicy Fruit gum to a tiny rectangle barely larger than its click wheel. It even went through a phase (the third generation) where it had no click wheel at all! The current fourth-generation iPod shuffle has inherited the best of the previous generations’ features, and after some further research I realized, to my surprise, that it might very well do, so I nipped out to Fry’s Electronics and bought one. I’ve had it only a few days, but it is already perfectly clear to me that, for my purposes, not only is it indeed the best choice out of the range of current iPod models, but in fact it’s going to work more than satisfactorily as a replacement for my beloved iPod nano. The Shuffle’s Mortal Coil — I’ll try to explain what I like about my iPod shuffle for my particular use case. Some aspects of the shuffle that might be thought weaknesses turn out to be strengths, or at least not significantly different from my old iPod nano; in one or two areas it definitely disappoints, but in ways I can live with. And some features of the shuffle turn out to be better than the nano! What I got was a slate (black) iPod shuffle (there are seven other current colors); it cost about $40, because Fry’s has a low-price guarantee and that was the Amazon price at the time. It is astoundingly small: the click wheel is about the size of a U.S. 25-cent coin, and the body overall is about the size of a U.S. 50-cent coin. The case is aluminum and feels very solid indeed. It is ridiculously light. On the back is a spring clip. After some experimentation, I have settled on attaching the clip to the top of the waistband of my running shorts, where I do not feel it at all. In this respect, the iPod shuffle is better than the iPod nano was; the nano involved the complication and pressure of an armband, while the shuffle just vanishes into my clothing. On the top of the device is a switch with three positions: Off, Normal, and Shuffle. I don’t expect I’ll ever use Shuffle mode, which randomizes play order within a playlist; I listen to podcasts in a set order, as I’ve said, and even a music playlist has a meaningful order to a classical music listener — it is not merely a grab-bag of independent “songs.” (A random movement from a concerto, or a random variation from a theme-and-variations, would be downright painful.) I don’t know whether I should be switching off the iPod shuffle between runs; so far I’ve not done so, and it seems to be holding its charge very well. If that keeps up, I might never need to switch it off. The click wheel, too, is actually better than the iPod nano’s click wheel. On the nano, the wheel’s four cardinal points and its center were buttons, but the wheel was also sometimes a wheel: to increase and decrease the volume, for example, or to navigate the tracks in a playlist, you had to treat the wheel like a touchscreen, moving your finger around the wheel in a circular gesture. On the trail, with a wet and dusty finger, I sometimes had difficulty with that gesture; the nano just couldn’t sense what I was doing. Also, the nano often got confused between my pressing the center button (select) and pressing the bottom of the wheel (play, pause, or — with a long hold — shut off). 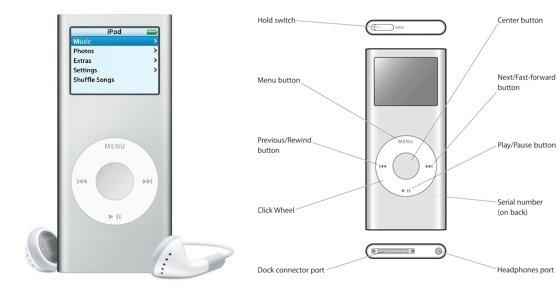 What the iPod shuffle has, despite the wheel shape, is really five distinct buttons: louder/softer (the north and south cardinal points), previous/next or fast-forward/rewind (west and east), and play/pause (center). The springy, clicky tactile response of these buttons is superb, and the raised wheel shape is easy to sense. As a result, I’ve become adept at pressing the desired button without looking (and a good thing too, since the shuffle, you remember, is located at my waist!). The center button on the iPod shuffle does a clever thing: if you hold it down for three seconds, it locks the click wheel (and produces, though the headphones, the lock sound now so familiar from the iPhone and iPad). The center button and the four cardinal point buttons are then unresponsive until either you hold down the center button for three seconds again or you shut off the device. This is useful to prevent accidental button clicks. I use this particularly when removing the shuffle’s spring clip from my waistband at the end of a run: it’s almost impossible to do that without accidentally pressing the click wheel somewhere, but such a press doesn’t do anything if the click wheel is locked. Managing what’s on the iPod shuffle is exactly like managing what was on the iPod nano. The shuffle holds only 2 GB of music. So did the nano. To manage what music or podcasts is on the shuffle, you have to plug it into a computer and use iTunes. That was also true of the nano. With the shuffle, however, it’s more important than it was on the nano to arrange things into playlists when you’re setting it up with iTunes. That’s because, when you’re out in the field, the shuffle, unlike the nano, has no concept of albums or composers; the playlist is the only unit of internal categorization available to you. And exactly how, you may ask, are playlists available to you when you’re out in the field with the shuffle? The nano, of course, had a screen, so you could dive into a list of your playlists or your albums or what have you. The shuffle solves the same problem by talking to you via VoiceOver. On the fourth-generation iPod shuffle, there’s a separate VoiceOver button, on top of the device. If you simply press and release it, it reads you the name of the current track, and if you use the click wheel previous/next buttons it will read you the name of each track you switch to; in this way, you can navigate within a playlist. To navigate to a playlist, you hold the VoiceOver button down for longer; the device starts reading you the name of every playlist, and if you click the center button just after you hear a playlist’s name, you’re now in that playlist. You can also double-click the VoiceOver button to hear a report of your battery status. Navigate the playlist via VoiceOver, listening to the titles of the podcast episodes, and counting. This seems clumsy, and is an invitation to lose my place. Memorize the contents of the playlist, so that when I hear a certain episode I know that I’m reaching the end of the playlist. Due to certain personal limitations of my brain, that’s not going to happen! Once back home, plug the device into the computer and examine the playlist with iTunes to see where I am. That’s the method I seem to be using so far. I’ve now described all the buttons and functions of the iPod shuffle, but I should also mention that instead of controlling the device through the buttons on the device itself, you can control it through the remote three-button switch attached to some headphones and earbuds. This could prove desirable out in the field; some podcasts that are not run through The Levelator include both very loud and very soft talking, and I find I can adjust the volume more nimbly with the remote than with the shuffle’s built-in controls. Oddly, the earbuds that come with the shuffle lack a remote switch; but that scarcely matters to me, as I detest those earbuds (they are the old-style Apple earbuds) and was certainly never going to run with them (the sound is lousy and they just fall right out of my ears). I would have liked to try Apple’s new-style EarPods but the shuffle, disappointingly, didn’t include them. Note that if your favorite listening hardware doesn’t include a remote, you can obtain a short inline adapter, such as the iLuv Remote. The only downside to using the remote is that there’s a serious learning curve. There are only three buttons — Volume Up at one end, Volume Down at the other end, and a click switch in the middle — and the gestural language for obtaining particular functionality is far from intuitive. For example, wouldn’t you expect that to advance to the next track, or to fast-forward, you’d use the Volume Up button in some way? But no: it’s double-click the center button (and triple-click to go to the previous track). Apple has a useful support document listing the available gestures; I’m still studying it. My iPhone and iPod touch respond to the remote in much the same way, but I’ve never bothered to study the list of gestures; the iPod shuffle, with its lack of a screen, makes a knowledge of the full range of remote gestures rather more necessary. Not So Bad — So that’s the story of how I surprised the dickens out of myself by ending up with, and liking, an iPod shuffle. Whatever helps me get into my running togs and out the door is a good thing, and the iPod shuffle definitely does: with its impossibly tiny size and amazingly good sound, it’s like a secret personal trainer literally at my side. Part of me still regrets that I couldn’t go from old iPod nano to new iPod nano: why doesn’t Apple still make a nano I can run with? That part of me thinks that Apple’s abandoning the click wheel and small text screen of the older nano is a mistake; there are situations where a touchscreen is just not the right thing. On the other hand, I was very happy to find that Apple still makes any device I can run with; and there are many things about the iPod shuffle that I actually like better than my old iPod nano. Its tiny size, and even its lack of a screen, work perfectly for my use case, loading it up with a week’s-worth of podcasts or some newly acquired audiobook and taking it out in the wind and weather and pounding the pavement and trails for an hour every day. It’s simpler and more limited than the nano, but that simplicity and those limitations are perfectly appropriate; I wasn’t using the other features of the nano very much anyway. The only thing I really miss is being able to learn numerical statistics, such as what number track I’m listening to within its playlist or how much more of this track remains; but I can live without that, and I’ll have to. On reflection, I think that part of the reason why the iPod shuffle makes sense within the repertoire of available Apple devices, and my old iPod nano no longer does, is that the iPhone and iPod touch now exist. It’s hard to believe, but in its day, my second-generation iPod nano was the last word in powerful, ingenious interface. I remember literally dancing in triumph around my friends with other MP3 players (as they were called) who could barely figure out how to skip the current track, let alone how many more tracks there were. And the nano could do a bunch of other tricks I haven’t even mentioned, such as holding and displaying your contacts, calendar, and text notes, and displaying photos! It had an alarm, a sleep timer, and some built-in games!! It could even record your voice!!! There was a time when I was travelling on airplanes to conventions with my iPod nano as my primary portable device. Now, however, the iPhone does exist; and we all know what that means. With its sophisticated touchscreen, amazing computing power, and astounding communication and sensory hardware, the iPhone will surely be your travelling companion of choice; so who, nowadays, needs a device with a crude tiny screen and a confusing click wheel interface? That interface was revolutionary in its own way, and for the sake of history and nostalgia I’m glad that the iPod classic preserves it; but I do understand why Apple might not want to make itself look ancient by continuing to provide it. All I ask is that Apple should remember this: runners exist; the world is a bumpy, scratchy, dusty place, with blazing sun or drenching rain; and the touchscreen is not the be-all and the end-all. Now that I’m an iPod shuffle owner, I just hope Apple doesn’t abandon that as well. Comments About How I Got an iPod shuffle — and Liked It! Yes, I'm sure the teen wants the bells and whistles (touch screen etc.). Grab the thing, if you can find it...! The Shuffle is certainly cost effective, but beyond that, I don't think it's the best solution. Headphones with an in-line three button remote are about as effective as the Shuffle's physical controls. Equipped with headphones with such as remote, I think a nano, touch, or iPhone is a fine running companion. Even better for working out is a set of Bluetooth headphones with remote functionality. Pick your playlist/album/podcast; stow your iPhone, touch, or nano somewhere safe; and you can listen and control the device wirelessly. There are also Bluetooth adapters about the size a shuffle that will let you use any headphones for a similar purpose. But that's just my take—and for price, the shuffle clearly wins, even compared to just adding Bluetooth headphones to an existing iPhone, etc. Beyond that, these things are largely a matter of tradeoffs and personal preference. The only time I'll risk running with my iPhone is when I'm in an unfamiliar city and feel that I need the iPhone in case I get lost or need other digital assistance. Then I use a waterproof Amphipod pack that clips inside the back of my shorts. That works, but it's not too comfortable. The iPhone and iPod touch are just too large to be attached to the body comfortably for many of us. All this said, I don't run with any audio devices normally, in part because I like hearing the outside world (for enjoyment and safety reasons) when I'm alone, and when I'm running with friends, it would just be rude. "The only time I'll risk running with my iPhone is when I'm in an unfamiliar city and feel that I need the iPhone in case... That works, but it's not too comfortable" Exactly, and I did hedge a little in the article to allow for that. Also, when I go on trips, I don't want to take all my normal running equipment so I'm willing to make do with the iPhone, which I have anyway, rather than also bring a separate device and the Garmin. Running is not working out. This is not the gym; it's the elements. I have Bluetooth headphones I like, but I believe they'd be wrecked in a week by taking them out on the hot dusty trail every single day with me sweating into them. Even as it is, *normal* headphones don't last very long; I tend to buy super-cheap Coby or Sony headphones exactly because they have to be nearly disposable. To avoid having to remember a track number in your playlist, I would recommend to use a dedicated smart playlist that is auto-populated with new podcasts as they appear (in iTunes). The trick is to add this rule: (and) "Plays is 0", i.e. only unplayed episodes. This means that each episode is removed from the list once you listened to it to the end, when its play count is incremented. Finally, make sure it is sorted by release date such that newest episodes will be added to the end of the list. Now you can sync the iPod whenever you like; the list will be updated automatically! I would suggest Apple to add a microphone and Bluetooth. Then the Shuffle could act as a headset for mobile or other phones. This would extend the range of uses significantly. I live in fear that Apple will one day stop making any iPods with physical interfaces. There are just too many situations where they are well superior to touch screens. This has to be one of my favorite articles in a long time. I have been promoting the Shuffle for the last few years (especially a used 2nd Gen after the bad 3rd Gen came out). Do you sync podcast location with an iPhone as well or keep certain podcasts/books as running/shuffle only? Do you listen to podcasts at increased speed? I listen to books and podcasts at 2x speed, and unfortunately haven't found a great solution for my shuffle. You can also improve the tracking of which song/podcast you are on by changing the name of the track in iTunes on your Mac before syncing to the shuffle. For example you may be listening to the Moth podcast which lists tracks by name of person talking. Just go into iTunes and add a "1" before the first track name and continue the numbering scheme for the remainder and it will be easy to remember which track you are on, because when voiceover says the name of the track it will say "1 .... " . I personally prefer the smart playlist method mentioned earlier, less work, but the renaming of the tracks with beginning numbers works. I left my Shuffle attached to my running shorts and put it through the washing machine AND dryer, and somehow it still works. Not sure you'd get that with any other iPod! Does anybody have a good suggestion as to where you could still find a working 2nd gen iPod nano? I have the same 2nd gen iPod nano as Matt. And like Matt I really love it for running. But mine's about to die. I can't replace it with a shuffle because the most important feature to me is the Nike+ sensor that tells me how far I've gone and what my pace is. I also don't want to switch to using a modern iPod's built-in accelerometer with a Nike+ app. I haven't been able to find anybody selling off old 2nd gen iPod stock. Any good ideas? Have you looked on eBay? I see some there. Thanks, Adam. Unfortunately eBay websites abroad don't have nearly as much to chose from. My country's eBay website doesn't list a single 2nd gen nano. I've given up using an iPod when running, because I could never find ear pieces that don't fall out. Remember the Sony Walkman, with ear pieces that were connected to a metal springy thing that went over your head? That worked for me. I do carry an iPhone in a pouch strapped around my waist, for security - this is in case I fall, not in spite of the risk of falling. There are alternatives to earbuds. I've been running with Koss Sportapro headphones for years. They're lightweight, over the ear headphones that are durable and very comfortable. Best is that they don't fall out (as earbuds always do, for me), and they don't block out external sounds. Oh, and they're only about $20. This is an amazingly informative article. I've always been wary of the shuffle. Now I think it might be just what I want. (Replacing my little square nano that I put through the washing machine. :-(. There's something uniquely satisfying about a device that does one thing exceedingly well. F1 cars, push lawn mower, toasters. For me, the Shuffle falls into this category. Don't get me wrong, I love a good smartphone that does it all and then some. But there are times when I just want to use something that was designed for one purpose. It let's me focus on that one thing, and not get distracted by all the other "stuff" that more complex devices let you do. The Shuffle does it's job better than any other device out there. It plays your audio files. Period. For that, the Shuffle holds a special place in my heart. Right next to the gold (GOLD!) iPod Mini that physically sits tucked away in my electronics closet. Congratulation, TidBits. As one who has read and followed you since the days you were on HyperCard, I congratulate you! As for the iPod shuffle, I've used one of every generation for my running. The "chewing gum" model rusted (even with a cover) - probably due to perspiration. The current model (an updated version of the 2nd gen) is my favorite, and has all the pluses (and the one minus you mention of keeping count of tracks/podcasts played). I forgot about the ability to check the battery level with the top button, so thanks for the reminder. Matt, I'm curious why you didn't replace your nano with a second-hand one from eBay. Was this something you considered? Because that wouldn't have made a good TidBITS article!